Traditional Samoan voyagers have arrived in New Zealand for next month’s Festival of Arts in Wellington. But the crew of 16 are also reaching out to Māori sailing experts to assist in the revival of their own traditional practices. 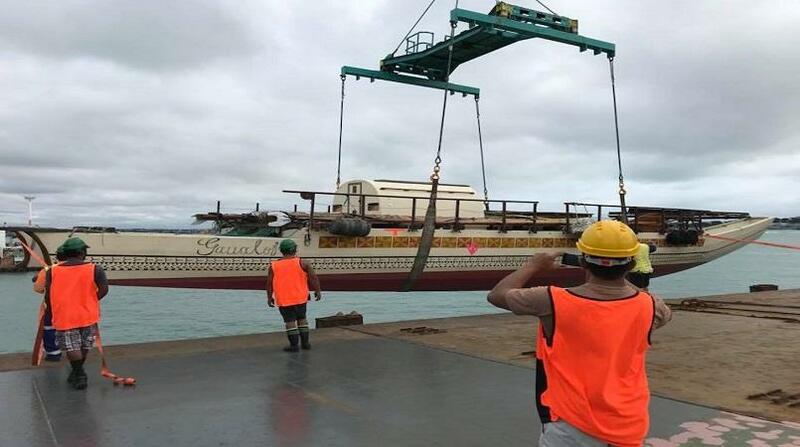 Samoa's only ocean voyaging vessel has been carried into Auckland. Gaualofa's crew of 16 are elated to finally have their beloved vessel back three weeks after it arrived in New Zealand on a container ship. This is Gaualofa's second time in New Zealand since it was carved in 2009. The crew have come for the New Zealand Festival celebrating Kupe. But their primary focus is to revive their traditional knowledge which was all but lost in the 1800's. Gaualofa has sailed the globe. But It's captain and ariki say, there's no point in reviving traditional knowledge in a environment suffering from severe climate change.